I’m a self taught musician, born in 1955, and since I can remember I loved all sorts of sounds, the nature sounds around me as well as most of the man-made sounds. 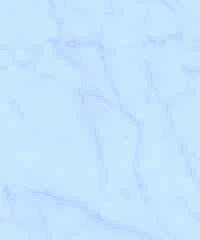 I prefer acoustic and electricly amplified music, which to me has a warm vibe, to the cold sounding computer generated or electronic music, which I only can handle in small quantities as a contrasting element. I come from a background of blues, jazz and world music and love the edge between music as a rhythmic and melodic structure and sound as an all embracing atmosphere with a tribal and trancy quality. I keep things simple when I play music and just follow my feeling and some sort of an inspiration. When I play I believe I tune into the atmosphere around me as well as into earth and cosmic vibrations, but I cannot really explain how this happens and works, it somehow just does. I preferably play constructive music improvisation (and hate chaotic cacophonic noise and egotistical unrelated "self-expression" sessions), but I also play compositions with defined and arranged musical structures. I’m a multi-instrumentalist with a huge collection of instruments from around the world, but my main instrument is the guitar. I also invented and build some musical instruments myself, like the Euklang (a tuned metallophone made from an aluminium washing machine drum) and the Sitalin (a long neck lute with an overtone bridge) and a few other ones. I also like to discover good sounding objects in my environment (where I move about in my everyday life). Using these found sound objects in combination with other musical instruments creates a varied new and special sound atmosphere. My earliest musical memory is when I was one year of age lying in a pram on the balcony listening to the chicken in the yard and at the same time making rhythmic clicking sounds with my tongue. With 4 years I played my first "harp", an egg cutter with wires to cut hard boiled eggs into slices, with 5 years I build my first "guitar" from a cigar box with elastic bands of rubber stretched over it. With 7 years I had to play folk songs on the recorder from notes with a group of other kids. However I played the tunes actually by heart and not from notes, but after 2 years the teacher finally noticed that I could not read music. I was not too sad that I had to leave the recorder group as I rather spend time on my own deep in the forest making sounds with my voice and discovering the world of an old natural magic. With 10 years I lost interest in music and sound. In 1970 when I was 15 years old I started listening to Rock music. My older brother Michael had an acoustic guitar and one day I found myself playing along to the signature riff of "Satisfaction" by the Rolling Stones on the bottom E string. It all went from there and I tried to copy my favourite songs as good as I could on an acoustic guitar After school I often hung out with other young people in the town park and there were always some guitar players, whose fingers I watched closely and I learned a lot of chords that way. But when I played guitar there was also an inexplicable impulse and my fingers just had to move in a certain way and surprisingly it sounded o.k.and I started to develope a way of playing guitar by mainly following this kind of feeling or intuition. 1972 I really got into jamming with other young musicians in the park and I carried my guitar around everywhere. In 1973 I bought an electric guitar and as amplifier I used old radios that had been dumped outside private houses for waste collection (Sperrmüll). These radios (similar to the one in the Cosmic Radio picture on the home page) never survived too long due to the horrendous volume levels by cranking it all up to the maximum, the sort of thing some teenagers do. I always managed to soon pick up another one of these old radios as replacement for the blown one and bring it home on the back of my bike. Eventually I bought a 20 Watt GEM amplifier and my neighbours were not exactly delighted once I started using feedback and the whammy bar. (I didn't like their music either: James Last!) 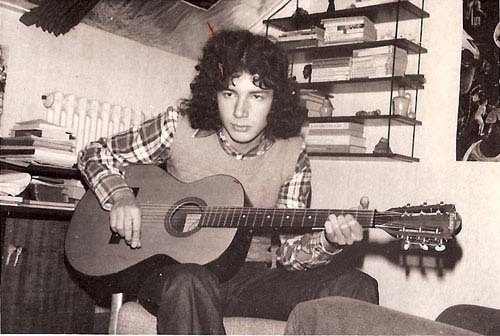 Also in 1973 I played my first public gig as part of a music night in my school, I was quite nervous, but everything went well and I even played an own song. 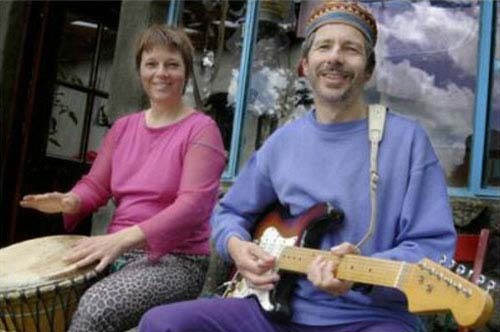 In the summer I hung out a lot in the park in Delmenhorst my eyes glued to the fretboard of more advanced guitar players. We went to see Rory Gallagher in Bremen and he certainly blew our minds (I recorded the concert on a reel to reel recorder). In the mid 70s I moved to Bremen and I played in various short lived prog rock and punk bands. Anyway, the only thing I really was interested in was jamming with other musicians of any genre and it always amazed me how a piece of music could be created just like that - on the spot by playing in a spontaneous way and listening to each other. I think it was that kind of surprise to hear something completely new, something that I had never heard before that turned me on back then in the 70s as it still does now. The musical possibilities are as infinite as the omni-verse itself. 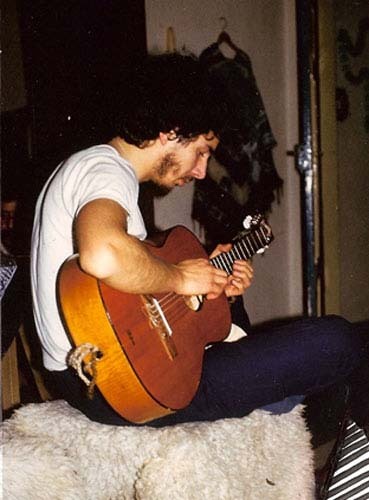 In 1980 I moved back to the country and lived in a very musical community in the north of Germany, where we had a lot of spontaneous jam sessions which I sometimes recorded. In 1984 I saw Sun Ra in Cairo in a small Jazz club. 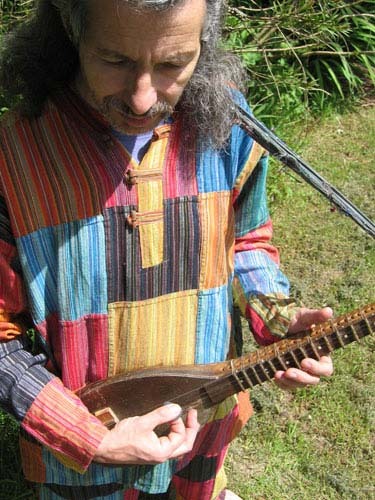 He gave us a hug as we were the only ones really digging his music, it was both like a revelation how to go about music as well as an initiation into cosmic and earthy improvisation. In 1986 I moved to West Cork in Ireland where I played together with flute player Jeremy Baines (who had played in the 70s in London with Egg and Hatfield and the North) and we released some quite diverse music on tape cassettes. 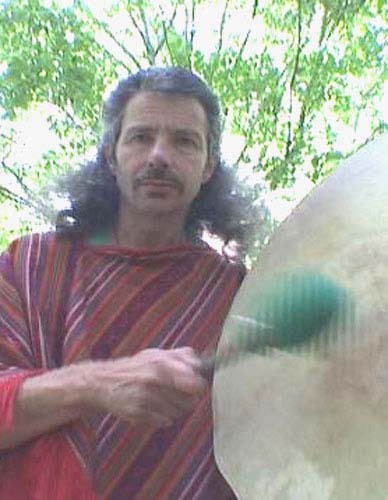 Experiencing percussion music in its original surroundings was in its traditional culture with its community orientated lifestyle changed me and my perceptions of society profoundly in many respects. I participated every evening in the communal drumming and dancing session. I witnessed that everyone could join in according to their abilities, nobody was excluded. A certain common sensitivity guaranteed the appropriateness of the individual contributions, thus enriching the social and musical structure by creating a wide ranged microcosm. Everything and everybody seemed to support everything and everybody. A unique and perfect patchwork of peoples art was created every evening after work and this communal recreation was repeated in ever changing variations , true to the spirit of the moment , a celebration of life and aliveness. In West Africa any ability or talent is considered as a gift of God or the spirit or a way of the past away ancestors to connect with the living. This is in stark contrast to the western eliteness ego orientated and money driven music culture or business. 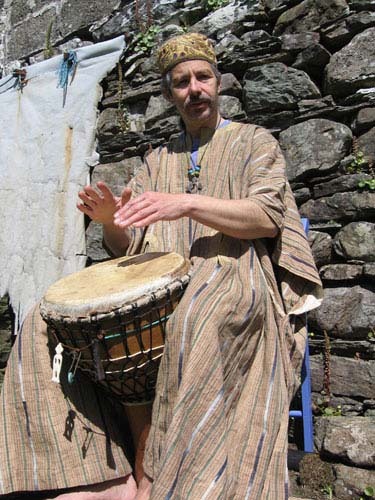 Famoudou advised me to watch the feet of the dancers closely and use that as a reference to my own drumming. I also met master drummer Mamady Keita (Then still a sergeant in the army who emphasized on to develop "Le feeling". In 1991 i travelled to Bali , Indonesia. I took percussion lessons on a metalophone of the Gamelan orchestra called Gangsa , which is similar to the western vibraphone. 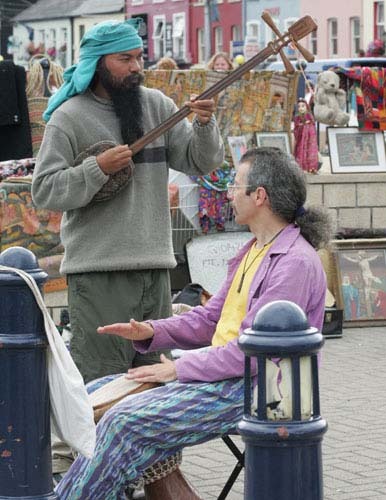 The gangsa is played with a mallet in the right hand and then the sustained sound of the metal key is stopped with the left hand , which takes some practice to master. My teacher was Anak Agong Raha , a frail old man who , sat opposite me thus mirroring the ordinary gangsa playing and at the same time he was singing the Kendang drum part with his voice, always smiling and occasionally encouraging me in his broken english " drum give you spirit " as to beg the higher forces to grant me some progress. He also said " music must enter your liver " tapping on that part of his body. I was invited to the temple ceremonies which lasted all night. i was the only foreigner present and eventually I fell into a deep trance into the repetitive , slowly changing grooves of the ceremonial Gamelan music. One Balinese man later smiled at me and said " the spirit likes you " . I walked home when the sun rose the next morning feeling very happy and at peace and new that this was a spiritual charge that still was practiced on Bali as a ritual of the Hindu Dharma religion, a combination of Hinduism and the original old animistic beliefs. 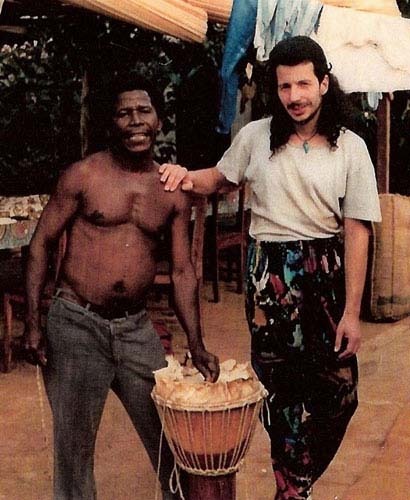 In the early 90’s I got more and more into West African Djembe drumming. I lived together with Togolese drummer Anani Attih in Heidelberg/Germany. 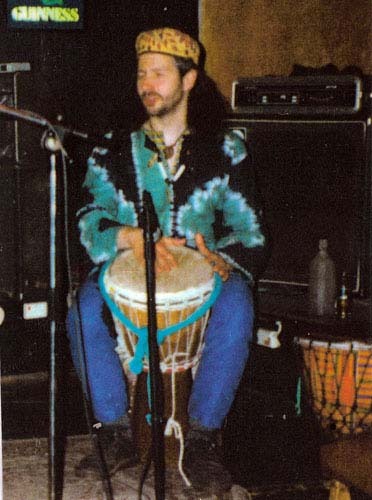 Back in Ireland 1994 I started building Djembe drums and also DjunDjun bass drums as they were not available in Ireland in the early 90s. People who bought my drums asked me to teach them to play Djembe but I refused that first as I didn't know enough about it myself. 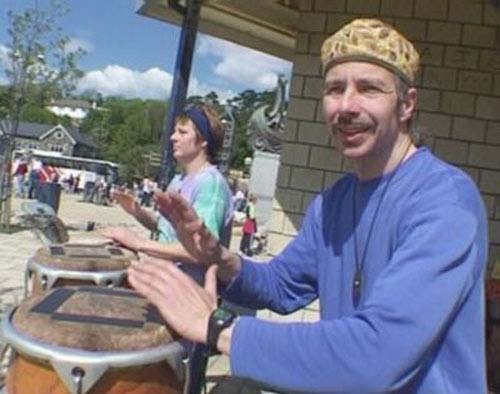 They insisted and eventually with a lot of hesitation on my part I started to give drumming workshops in 1995 in Ballydehob, West Cork, which were a lot of fun and well received and word of mouth spread and people came from all over Ireland and even Germany. 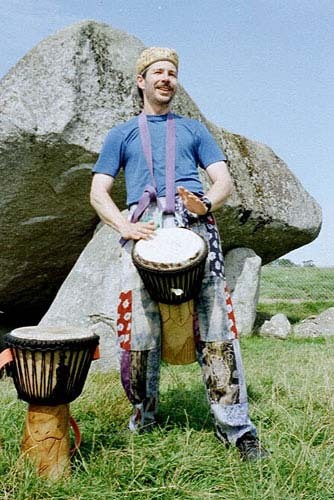 In 1996 I opened the Nature Art Workshop Centre for drumming, art and healing as well as the first and only professional drum and percussion shop and mail-order in Ireland. Over the years I have worked with many different community groups such as YMCA, Foroige, Youth Reach, Boy Scouts,etc. I also worked for the Irish Health Board and various special needs/abilities and mental health organizations. Many corporations have booked me to facilitate team building workshops with drums, which have always been very popular as they combine playing and learning in a light hearted way. I have facilitated over 1000 workshops and don't tire to do so as it's always fun and a new situation. 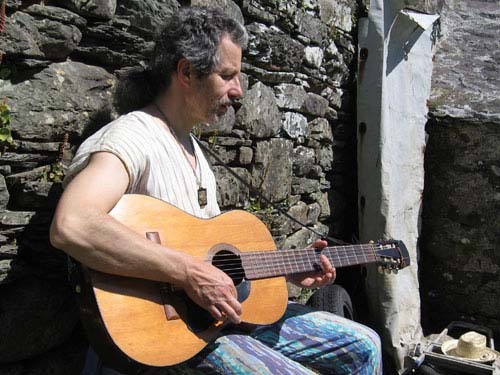 In the 90s I also performed meditative concerts called Dream Waves in which a peaceful and trancy atmosphere relaxes the busy minds through the sustained sounds of Tibetan Singing Bowls and other acoustic instruments from around the world. 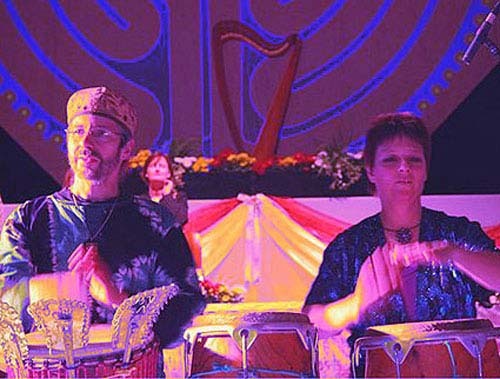 From 1997 to 2001 I toured with various West African musicians in Ireland performing gigs and giving drumming workshops. Over the years I have played with many musicians from around the world and my music reflects the influences from many different cultures. Thomas has been working as a healer and therapist since 1990. 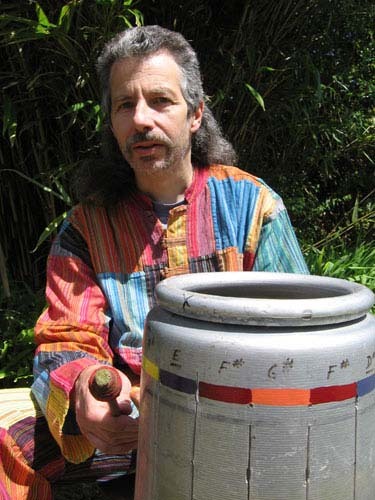 He gives sessions in Sound Healing (using Tibetan Singing Bowls), his own Music Therapy approach, Healing Drum rhythms, Sound Meditation, Shamanic Journey and Life Guidance. Back to the beginning " and "SoulScape"
My approach to playing music is to know what I’m doing in terms of keys, scales, rhythms, themes, phrases, etc. and then go with the energy or spirit of the moment and improvise or jam in a jazz-like way. Another approach is not to think about the music too much and rather "feel" my way and at the same time to listen that my musical contribution is improving the improvised piece of music rather than making it worse. If I cannot tune in with what is going on at any one time, then I do not play at all and enjoy just to listen. Music is magical, when I play it as well as when I listen to it!